I stay away from user comments on YouTube as they provide little to no value most of the time. In fact, you could say that they are annoying or even worse than that. Some YouTube users like comments on the other hand and even those users have to cope with a massive amount of useless comments that serve no purpose but to troll on the site. If you read comments on YouTube occasionally or regularly, you may want to hide or remove comments on the site that are of no value. While YouTube does not offer any means to do that, you can use third-party programs to hide annoying comments on YouTube automatically and for as long as you like. 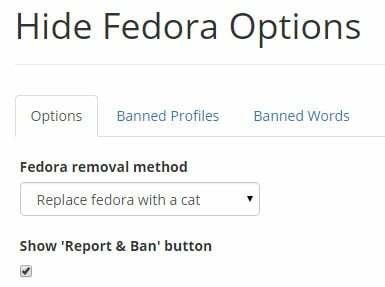 One of the better browser extensions for that purpose is Hide Fedora which is available for Mozilla Firefox and Google Chrome. Designed to block Fedora comments on YouTube, it has since then been expanded to block other comment types on YouTube. What you want done with comments matching your specifications. You can either hide them or replace them with cats. Banned profiles enables you to ban YouTube users so that their comments won't be displayed on the site for as long as the ban is active. Banned words on the other hand allows you to add words or phrases so that all user comments matching those are automatically blocked as well (or replaced with cats depending on your configuration). The extension maintains a remote blacklist as well which you cannot control. According to the author of the extension, it is mostly designed to block users from Reddit who banded together to leave comments on YouTube. As you can see on the screenshot above, two of the three comments were replaced by the extension automatically. Note that there is no option to display the removed YouTube comment again or the name of the user whose comment was modified or removed. When you hover the mouse over a comment, an option to ban the user profile is displayed in form of a HF icon. When you click on it and confirm the prompt, that user is added to the local banned profiles list so that all comments of that user on YouTube are not shown anymore. Hide Fedora works well both in Firefox and in Google Chrome. The one thing that I dislike is that you don't have control over the global blacklist. An option to decide whether you want to use it or not would certainly be appreciated by users of the add-on. Previous Post: « Can Yahoo Screen become a serious YouTube competitor? I use the first one (Block all YouTube annoyances) with greatest satisfaction. Whatever the tool, comments on Youtube are for most of them so appalling that I’m starting to wonder if there aren’t more Youtubers that avoid them then those that participate. Even if generally speaking I’m not fond of the idea of avoiding one’s speech (a correlation to an elitist attitude?) I admit that Youtube comments break my rule. The comments now days are just a playground for ignorance. My solution…I just don’t scroll down. People who post to YouTube complaining about these hilarious comments or promoting the fedora extension exponentially more annoying than the content they are trying to censor. It has been suggested over on r/conspiracy that this is, in fact, a government conspiracy to censor free-thinkers. Hello, I am one of the devs of hide fedora who works on the backend of the site. Thanks for mentioning our browser plugin. I have taken your suggestion to disable the global blacklist if the user wants and added it to our issue tracker where we will decide if we would like to add this feature. If you have any questions feel free to get in contact with me. How ironic that I gave up on commenting on New post and it’s been one of many changes for 2015, of course the only place I’ll leave comments are here ghacks. Even though I kinda gave up on Add-ons this year I still added to bookmarks. Thanks for the info about HTTPS and HTTP because it was really picking way at my brain, Nevertheless keep up the great work. Didn’t work for me at all. Youtube really should provide a way to hide all comments without needing to use another program… even if it is on a video by video basis. Does anyone who works for Youtube even have or work with children? Doesn’t seem like it.